Hailing from Limerick and now based in London, Whenyoung are an exciting trio giving indie-pop a run for its money. Defined by a style that effortlessly packages up feelings of youthful fears and hopes with vocals laced in conviction; catchy melodies and an irresistible beat. 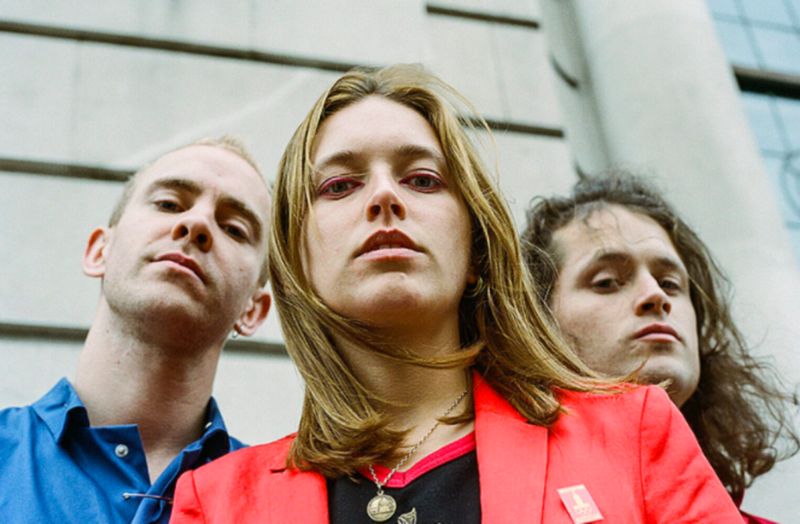 The band have recently finished their UK tour off the back of a festival-packed summer, and are now off on a European tour supporting the Vaccines. In the midst of the madness, CUB caught up vocalist Aoife, guitarist Niall and drummer Andrew ahead of their first London headline show at Boston Music Room on their tour, influences and style. How is the tour going so far, and how do you feel about being back in London for tonight? Aoife: It’s going really well. It’s our first headline tour and we’re really happy because people have turned up! Niall: We’re excited to be back in London for tonight. We live here, it feels like a sort of homecoming. Aoife: A lot of our friends are coming tonight who we’re not seen in a while. What was it like when you first moved from Dublin to London, not knowing many bands and not coming from a distinct Irish “scene”? Aoife: Like when you go on holidays and all the other kids are friends. You just kind of stand on the outside and think, how do I get in there? Andrew: I thought it was fresh, fun and exciting! We played any gig we could find and got to know people that way. Niall: We have friends here now, to clarify. Are you looking forward to your hometown of Limerick after your tour with the Vaccines? Andrew: I’ve not even thought about it. It’s hard to know what to expect. I think people in Ireland are starting to catch on and realise that we’re an Irish band based out here. Hopefully it will be a busy show with lots of familiar faces. Niall: It will be nice to go home and sleep in the beds we grew up in. The band’s style is the perfect example of shimmering and accessible indie-pop, full to the brim with catchy hooks and propelled by a pulsing drum beat, which at times contrasts with the themes dealt with in their songs. Pretty Pure touches on escaping people’s expectations of your actions, and pursuing what you feel to be natural and right. Actors deals with social media and the insecurity it can create. Similarly, The Others was penned after Aoife witnessed the Grenfell tower fire whilst working in the area at the time. What was the reason behind you writing the song for the Grenfell tower fire? Aoife: People write songs for different reasons. Some make political statements and some write about beautiful things. The Others was personal – for me, it was a release, and something that needed to be talked about…the lyrics aren’t going to solve what happened, but they deal with this ongoing feeling that there will always be these people who are left out. I had to express it. Who in particular has influenced your musical style, and where else do you draw your inspiration from? Andrew: We don’t just draw on one artistic element, it’s about the whole package… the look, the feel, the visuals. Aoife: Our visuals are influenced by Jean Luc Goddard and his colour palette, he uses a lot of primary colours that stand out – we were all really drawn to that, the style feels great. Aoife: We do have a strong idea when it comes to visuals… though maybe we don’t all agree on them…. Our songs have a story and we try to play this out through our videos. What have been your highlights from this summer? Niall: Supporting Patti Smith in her Dublin show. She’s my hero, it was such a surreal day. I was so emotional, I can’t even remember playing the gig… not through alcohol… well, maybe a bit. Andrew: Collectively, that was the biggest one. Every show is great, they keep getting better and better. We played Ally Pally with the Vaccines which was amazing. We toured a bit with Declan McKenna too – his fans are so up for it, it was incredible, such an engaging crowd. What is a band or musician you’ve recently discovered that you’ve really liked? Aoife: They’re brilliant, really pure. Niall: They’re the hottest new Irish band? Terrible publicity, get rid of that! As expected, Whenyoung’s set and first London headliner was enchanting: the boiler-suited, EU flag adorned trio captivating and riling the crowd. The set included their cover of the Cranberries’ Dreams and a moving vocal performance of She Moved Through the Fair. It even ended with Riverdance. For those of you who aren’t already heading over to catch whenyoung in their European support or Irish shows, keep an eye out for them back in London soon. In the meantime, head over to their Spotify, and their E.P. which is out on November 9. ← 5 Fun Places to Discover Street Food.